New magazine day! Although I’m starting a new mag today, there’s one or two pictorials left for Rapture. I was thinking for variety sake I would introduce something new. I might get back to it, but if I don’t the pictures I haven’t blogged yet are available to view in my Imgur account, along with other pics. I will include the cover/back first then a pictorial, with cropped pics then the layout pictorial. 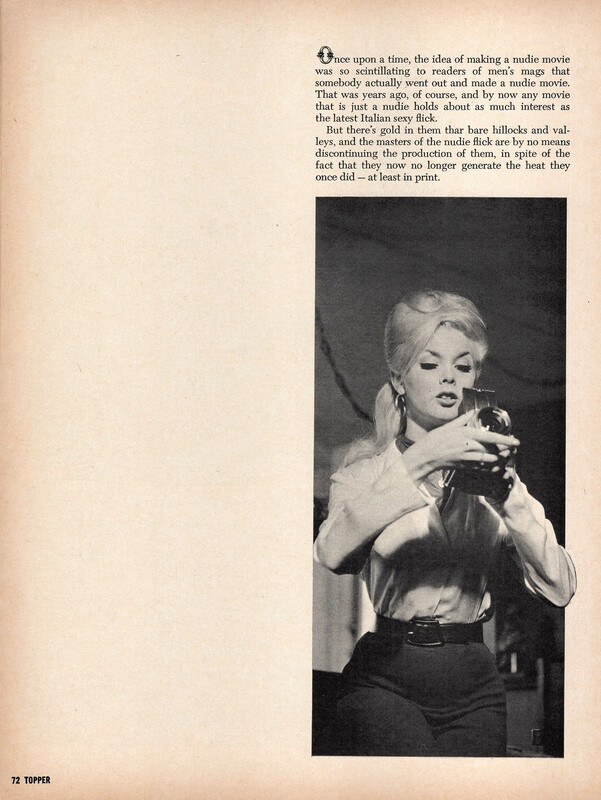 Bare Skin in Gotham Starring Laura Eden is a short write up about a movie Laura starred in called “Laura Eden’s Magic” and talks about the trend of making ‘nudie’ movies; I couldn’t find any info on the film. It’s kinda weird to me that they state “in spite of the fact that they now no longer generate the heat they once did- at least in print” mostly because ‘nudie’ movies were still kinda new in 1965, perhaps because there wasn’t mainstream penetration at the time? They go on to say “There isn’t much else to say…but that it’s worth looking at. After all, what are girls for?” which I think is the funniest part of the article. The actual write up is pretty short, feel free to read and comment about your take on it. Laura is adorbs, and I’m sure you’ll like her pics as much as I do. Enjoy!